Wood is considered a combustible material. Heat clearances must be adhered to.Before installing, check your local building codes and the manufacturer's instructions for your specific fireplace insert or stove. Pearl Mantels features fine furniture quality, stunning details and classic designs that will enhance any decor. 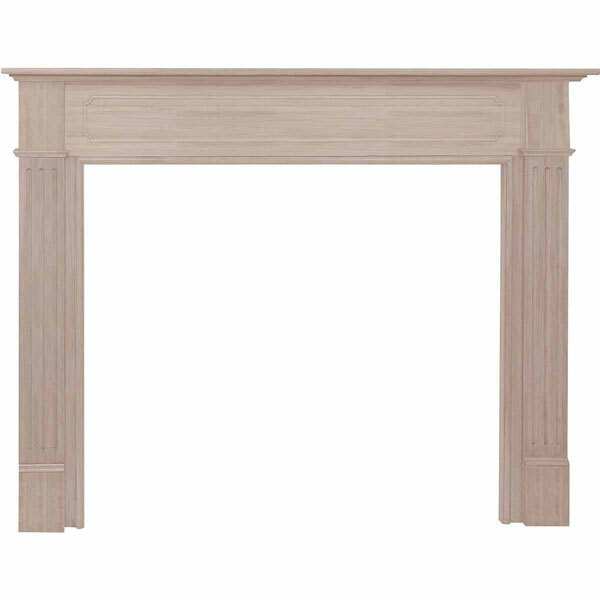 The Williamsburg mantel will frame your fireplace with grace and timeless beauty. Hand crafted from Asian hardwoods and veneers that are light in color and tight grained. Takes paint and stain beautifully. The mantel ships in 3 pieces; 2 legs and 1 header. The legs attach easily to the header with nuts and bolts. 3 piece mitered scribe molding set included to hide any gaps after installation. Look for the pearl inlay that graces the right hand side of the shelf as proof that you have received an authentic Pearl Mantel. Your inlay is masked so that you may easily paint or stain around it. Simply remove the mask when done. Available unfinished only, paint and stain grade wood. Light sanding and filling is recommended before paint or stain is applied.